Of all the items that go on sale during Black Friday, perhaps none are more anticipated than TVs. And with good reason! Retailers consistently drop television prices to draw in shoppers, and we routinely see the best offers of the year. Even so, we expect Black Friday 2017 to stand out, with lower TV prices than we've ever seen before. So what can you expect from Black Friday TV deals? We've created a "cheat sheet" with the top tips you need to know when shopping. Savvy consumers who want more information should scroll down for our in-depth analysis. After reading our tips, consider signing up for the DealNews Select newsletter to keep track of the latest deals in your inbox, or download our app to have them at your fingertips. You're likely to see prices on 4K TVs that are nearly as low — and perhaps even as low — as those for 1080p TVs of the same size. Shop early! Expect to see great deals on Thanksgiving, as well as the days leading up to it. If you're shopping for a very large TV, look for a deal that includes a gift card. Be realistic. Don't expect to nab an outrageous doorbuster deal, as stock is frequently in short supply. Consider going off-brand. If your budget is tight, off-brand sets of all sizes can be had for considerably less than a name-brand TV. 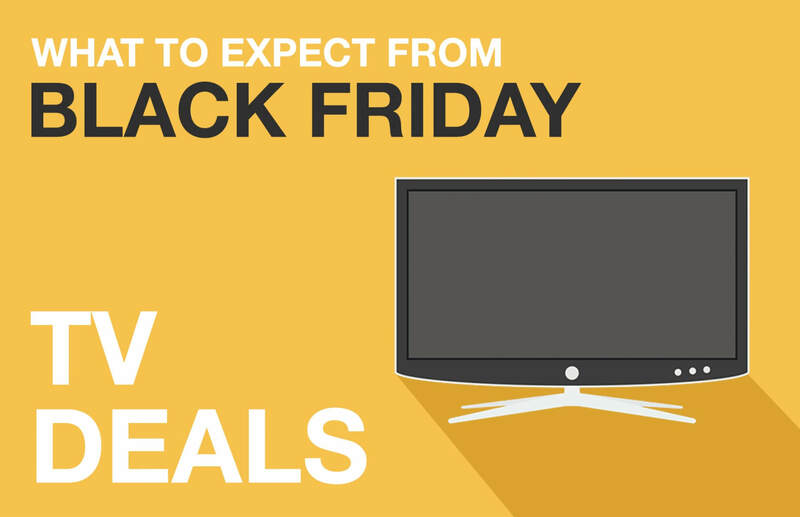 Want more details on how, what, where, and when to buy TV deals this Black Friday? Then check out our full analysis below. While last year we saw a plethora of 4K televisions at very affordable prices, we anticipate those prices will drop even lower this year. In fact, it's possible that in some size categories, 4K TVs could actually match their 1080p counterparts. So even if you don't want a 4K TV, there may not be a reason to buy a 1080p TV anymore. Prices on 4K TVs have dropped so low that this year they may actually match their 1080p counterparts in at least one size category: 55". With off-brand prices frequently dipping below $300, 55" TVs have become ubiquitous among the deals we see every week. Come Black Friday, we think doorbuster prices on off-brand 55" 4K sets will hit $239 — and 1080p doorbusters will cost the same. The average off-brand 55" 4K TV deal during Black Friday will cost just 8% more than its 1080p counterparts. On average, we expect off-brand 4K TVs to cost just 8% more. Brand-name sets won't come as cheap, but you should still see prices of $500 or less, which was unheard of just two years ago. Where once it took a king's ransom to buy a king-size 4K TV, prices on bigger sets have plummeted — like those of their smaller brethren. And though some may argue to the contrary, to truly appreciate ultra high-def resolution, one needs a big TV. Expect doorbuster prices on 60" and 65" 4K TVs to drop under $500, while 70" sets will be easily had for under $1,000. With larger sets having become the de facto go-to size for many buyers, smaller midsize options can yield big savings. Naturally, the smaller the screen, the smaller the price, but there are some sizes where the savings are proportionately greater. Believe it or not, 60" and 65" 4K sets will be priced under $500, while a 40" 4K TV will drop to $240. One spec set that stands out is name-brand 40" 4K TVs. We're predicting an average price of $240, which is just $50 more than an off-brand TV, and nearly $200 less than a 50" name-brand 4K TV. And of course, that's just an average price, so it's quite possible we'll see doorbusters in the $200 range. While Black Friday is known for having incredible TV deals (and this year should be no different), last year we saw a greater number of Editors' Choice deals on Thanksgiving. That doesn't mean you have to give up spending time with family; just be sure to find out when stores are dropping the TV deals you want. (Or let us tell you! Set up a deal alert so you'll know exactly when they go live.) If you don't find the TV you want on Thanksgiving, there will be plenty more deals on Black Friday — and Cyber Monday will have its fair share, too. When it comes to TV deals, it never hurts to start shopping early; we saw Black Friday-caliber prices as early as November 10 last year. That said, it never hurts to start shopping early. Be on the lookout for Black Friday-caliber deals as early as November 10. Last year, that's when we saw a 70" 4K drop below $1,000 for the first time ever, and Walmart offered up an all-time low on a 55" 4K TV. Last year, there was a clear winner in the Black Friday TV price wars: Best Buy. The big box store had more Editors' Choice deals than nearly all of its competitors. In fact, it had more than twice as many as Walmart. And while Dell did have more Editors' Choice mentions, Best Buy had better outright prices. Dell was the only store to have more Editors' Choice TV deals than Best Buy last year. However, those deals almost always hinged on the inclusion of a gift card. If you're able to make use of a Dell gift card with a second purchase from the retailer down the line, these are the TV deals to watch in 2017. Otherwise, you're better off looking for lower outright prices elsewhere.